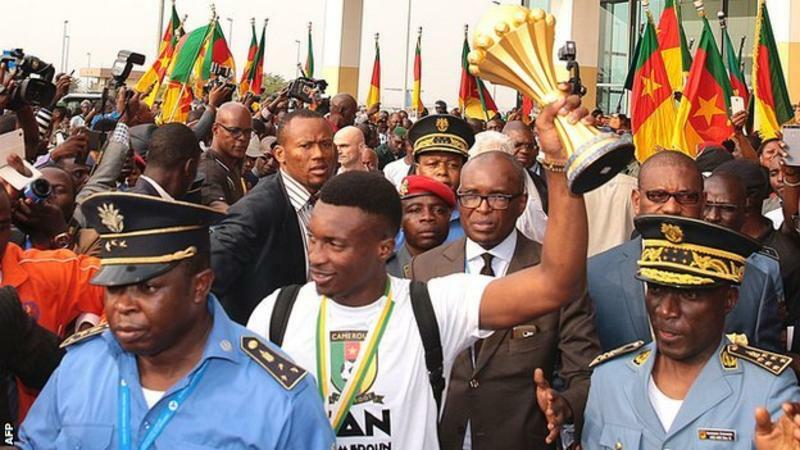 Cameroon’s Africa Cup of Nations-winning squad have been given a special state reception by the country’s president Paul Biya. The Indomitable Lions, who lifted the trophy on Sunday after beating Egypt 2-1 in the final in Gabon, attended a ceremony in Yaounde on Wednesday. They presented the Nations Cup trophy to President Biya at Unity Palace. Later, they travelled in open-top vehicles through the streets of the capital to parade the trophy to fans. Cameroon’s players were given medals by the president, who said their victory should be celebrated by Cameroonians as one nation. At the end of the ceremony Cameroon First Lady Chantal Biya posed for a series of photos with the players – at one point she used Fabrice Ondoa’s phone to take a ‘selfie’ with them. Cameroon’s success in Gabon ended a 15-year wait to win the tournament again and gave them their fifth title. The country will host the next edition of the Nations Cup in 2019.